the installation manual enclosed with this unit. Thank you for purchasing a Panasonic High Speed Color Scanner. weights, from very thin 20 g/m² (5 lbs.) paper to very thick 209 g/m² (56 lbs.) paper. * Speeds based on scanning A4 size paper in portrait orientation. documents and try to stop scanning before any damage is caused to the scanner. 3 different locations (left, center and right), which can detect a variety of double feeds. straight path, you can scan long sheets of paper or thick sheets of paper. documents of differing paper sizes. The paper feed path can be opened widely to easily removed jammed paper and perform maintenance. addition, 3 software reference manuals are included. The Installation Manual explains the installation method and procedures. and maintenance of the unit. Technology) features using the ISIS and TWAIN drivers. Windows® refers to the Microsoft® Windows® operating system (hereafter Windows). Windows® 2000 refers to the Microsoft® Windows® 2000 operating system (hereafter Windows 2000). Windows® XP refers to the Microsoft® Windows® XP operating system (hereafter Windows XP). Windows Vista® refers to the Microsoft® Windows Vista® operating system (hereafter Windows Vista). The illustrations in this manual are of the KV-S4085CL / KV-S4085CW. ISIS and QuickScan Pro are registered trademarks or trademarks of EMC Corporation. 5 GB or more free space is required. The above system requirements may not satisfy the requirements of all operating systems. Due to the slower speed of USB 1.1, it is recommended to use a USB 2.0 interface. If you connect the scanner to a USB hub, it is not guaranteed to work. the interference at his own expense. void the user’s authority to operate this device. conformity with EN ISO 7779.
and safe operation of your unit. to operate the unit safely. The power source voltage of this unit is listed on the nameplate. or become hot to the touch. grounded (earthed) through the normal wiring. outlet, contact a licensed electrician to replace the AC outlet with a properly grounded (earthed) one. (ex. do not use a conversion plug). the power cord, and plug. they have been swallowed, contact a doctor immediately. paper fluid including isopropyl alcohol. Never touch the plug with wet hands. Danger of electric shock exists. contact your dealer for service. Do not alter the unit or modify any parts. The unit should be used only with the power cord enclosed with the unit. source for a long period, degraded insulation may cause electric shock, current leakage, or fire. and plug. It may cause an electric shock. To prevent fire or shock hazard, do not expose this unit to rain or any type of moisture. Prolonged exposure to these adverse conditions may cause fire or electric shock. could result in fire or electric shock. the unit off, and unplug the power cord. their surroundings immediately after continuous scanning. This area is very hot and can cause burns. close the straight path tray. Do not use the hopper hanging out of a table. When carrying the unit, do not use the hopper as handles. cause injury and damage to the unit. notched section can cause injury. closing the front door. It can cause injury. mains plug for your safety and convenience. purchased from your local Panasonic Dealer. Open the fuse compartment with a screwdriver and replace the fuse and fuse cover. PLUG CUT OFF AND DISPOSED OF SAFELY. draft, or near heating apparatus. generate electronic or magnetic noise. Protect the unit from static electricity. to a warm place. It may cause dew. fingerprints or otherwise damage the CD-ROM. Do not throw or bend the CD-ROM. rollers and image sensor covers. refer to the Material Safety Data Sheet (MSDS). obtaining the Material Safety Data Sheet. damage the unit, document, or both. • Periodically back up important data. completely erase any stored image data. for either its completeness or accuracy. prevent illegal duplication from being made. For details, refer to "Control Panel" (page 16). Lights when an error occurs. For details, refer to "About Status Indicators" (page 18). installing an imprinter, refer to "Pre-imprinter" (page 67). installing an imprinter, refer to "Post-imprinter" (page 69). Plugs may vary in shape depending on country/area. direction, refer to "Selecting the Paper Path for Scanned Documents" (page 25) . Adjusts the hopper position. See "Changing the Hopper Position" (page 23). • During scanning, pushing this key stops scanning. Shows the scanner's status. For details, see "About Status Indicators" (page 18). For details on "Manual Feed Mode", refer to the RTIV Reference Manual or PIE Reference Manual. Check the status of the scanner using User Utility. For details about User Utility, refer to the User Utility Reference Manual. 1. Set the power switch ( 1 ) of the scanner to " " (ON). The ready indicator ( 2 ) lights green. The acceptable documents for this scanner are as follows. of sheets of the document loaded on the hopper. must be less than 1.5.
page must be less than 1.5. • Thick or irregular documents such as envelopes, documents that are glued together, etc. even documents that should be acceptable. – Clean the rollers and sensors. – Reduce the number of sheets of paper loaded on the hopper. – Scan the documents using manual feeding. document, and then perform scanning. is at the same level as the feeder. Setting the hopper position beforehand will shorten the scanning time. Press the hopper key ([ ] or [ ]) to change the hopper position. These guidelines are for using fresh, 64 g/m² (17 lbs.) paper. To avoid the double feeding or jams, you can set the paper thickness mode according to the document type. Press the paper thickness key to select the desired mode. The scanning speed may slightly slow. Scanned documents can exit from the front and back sides of the scanner. The paper path automatically switches when the straight path tray is opened or closed. If you are using the straight path, ensure that there is enough space for long documents to exit. of pages in the document. Remove documents from the exit tray after they have been scanned. When manually feeding a document, feed the document 1 page at a time. When scanning important documents or bound documents, feed them manually. A Fan the stack of documents to separate all the edges. B Hold both ends and bend the documents as shown in the illustration. C To flatten the documents, hold firmly and pull them apart as shown in the illustration. 3. Carefully align the documents. 4. Adjust the document guides ( 1 ) slightly larger than the actual size of the documents. 5. Place the documents on the hopper ( 1 ) with the side to be scanned facing up. Then push the documents in the direction of the arrow until they stop. may cause a paper jam or skewing. 6. Slide the document guides ( 1 ) to match the width of the document to be scanned. Pull out the hopper extension tray ( 2 ) from the hopper. position where pages can immediately start being fed. 7. Slide the exit document guides ( 1 ) to match the width of the document, and raise the exit stopper ( 2 ). If you scan documents with the exit stopper ( 2 ) down, documents may jam at the exit. Adjust the exit stopper ( 3 ) and extension sub tray ( 4 ) to match the size of the document. adjust the extension sub tray ( 6 ) to match the size of the document. Slightly raise the exit sub stopper ( 7 ). • The documents will exit smoothly since there is a smaller step at the exit. 8. Open your scanning application*1 and scan the documents. The software RTIV and QuickScan Pro demo, included with the scanner, can be used for scanning the documents. 1. Press the ADF select key on the control panel to select auto feeding [ ]. Fan the pages for each page size separately. 3. Align the document pages along one side. 4. Completely spread apart the document guides ( 1 ). 5. Place the documents on the hopper ( 1 ) with the scanning side facing up. feed rollers ( 2 ). If the document is not properly aligned, the pages will not be fed correctly. may cause a paper jam or skew. the number of sheets of the document. place the left edge of the document. Pull out the hopper extension tray ( 3 ) from the hopper. 8. Slide the exit guides ( 1 ) to match the width of the document guides ( 2 ), and raise the exit stopper ( 3 ). If you scan documents with the exit stopper ( 3 ) down, documents may jam at the exit. Adjust the exit stopper ( 4 ) and extension sub tray ( 5 ) to match the largest document page. adjust the extension sub tray ( 7 ) to match the size of the document. Slightly raise the exit sub stopper ( 8 ). 9. Open your scanning application*1 and scan the documents. Control sheets are located on the included CD-ROM. Multiple control sheets can be used. control sheets, refer to the instruction manual of your scanning application. Print out control sheets from the provided CD-ROM. Print the control sheet at the specified size; do not enlarge or reduce the size. Use the same size control sheet as the scanning document. In order to print control sheets, Adobe® Reader® must been installed on your computer. Refer to the instruction manual for your printer for details about changing print settings. 1. Insert the CD-ROM into the CD/DVD driver on your computer. • If you have a feature called "Autorun" activated, the installation process will start automatically. • The setup window will appear. If the AutoPlay dialog box is displayed in Windows Vista, select "CDRun.exe". select the CD/DVD drive, and then double-click "CDRun.exe". 3. Select [Control Sheet] from the [Manuals] list. 4. Print the control sheets at the same size as your document. black and white. The default setting is black. are different, then documents will not be scanned correctly. 1. Set the power switch ( 1 ) of the scanner to " " (OFF). • Remove any documents from the exit tray. 2. Pull the front door release ( 1 ) towards you, and open the front door ( 2 ). 3. Move the reference plate lever (R) ( 1 ) and the reference plate lever (F) ( 2 ). Move the levers to the color you want to change the background to. 4. Close the front door. • Push both sides of the front door down slowly until it clicks into place. 5. Set the power switch of the scanner to " " (ON). remove the jammed sheet according to the following procedure. The image sensor covers may be very hot after scanning a lot of documents. Removed the jammed sheet after the image sensor covers’ temperature has cooled. 1. Pull the front door release ( 1 ) towards you, and open the front door ( 2 ). Pull the jammed paper from the inside of the scanner towards the front. Pull the jammed paper from the exit slot ( 1 ) towards the front. 3. Close the front door. Clean the scanner at least once a month. 1. Set the power switch ( 1 ) of the scanner to "
2. Clean the cover with a soft cloth. • The document feeder ( 1 ) and exit slot ( 2 ) get dirty easily. Make sure to clean them. 3. Remove dirt and dust from the fan exhaust vent ( 1 ) with a brush. Clean the rollers and sensors if paper jamming or double feeding occurs frequently. If double feed detection does not function properly, clean the double feed detectors. Clean the image sensor covers when black or white lines appear on the scanned images. proper scanning, clean the scanner parts frequently. Open the roller cleaning paper on the dotted line ( 1 ), and take out the roller cleaning paper. Keep the roller cleaning paper out of reach of small children. Only use the roller cleaning paper to clean the rollers and image sensor covers. For details about the roller cleaning paper, please refer to the Material Safety Data Sheet (MSDS). 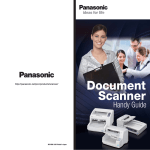 Please ask your Panasonic sales company about obtaining the Material Safety Data Sheet. If the bag is left opened for a long period of time before using it, the alcohol will evaporate. Please use the roller cleaning paper immediately after opening the bag. The roller cleaning paper (KV-SS03) is available from the dealer where you purchased the scanner. Call 1-866-823-0002 (U.S.A. only) or your dealer. path tray. Touching the notched section can cause injury. Clean the image sensor covers after the temperature has cooled. 1. Set the power switch of the scanner to " " (OFF). 3. Use the roller cleaning paper (page 48) to remove the dirt from the surfaces of all rollers. Feed Prevention Roller" (page 62). wiping it, gently hold it in place with your finger. 6. Reset the roller cleaning counter in User Utility to 0.
to reset to counter to 0. For details, refer to the User Utility Reference Manual. roller cleaning paper (page 48). as the conveyor indentations ( 2 ), and blow off dirt, as shown in the illustration below. 5. Close the front door. 6. Set the power switch of the scanner to " " (ON). See "About the roller cleaning paper" (page 48). removal, see "Installing the Ink Cartridge" (page 72). Prints text and numbers on documents. Includes 1 ink cartridge. To purchase replacement parts or optional units, contact the store where you purchased the scanner.
" (OFF), and unplug the power cord. 3. Push in both sides of the paper feed roller cover, and pull it towards you to open. 4. Turn the roller tip ( 1 ) towards you, and remove rollers from the shaft while opening the tip. • Remove both the paper feed rollers ( 2 ) and separation rollers ( 3 ). 5. Take out the new paper feed rollers and separation rollers in the optional "Roller exchange kit (KV-SS033)". 6. Align the shaft and the roller hole, and install the rollers on the shaft until they click into place. • Install both the paper feed rollers ( 1 ) and separation rollers ( 2 ). 7. Push up on the paper feed roller cover until it clicks into place. When closing the paper feed roller cover, do not damage the roller. completely, when closing the front door, the paper feed roller cover may break. 8. Close the front door. 9. Plug in the power cord, and set the power switch of the scanner to " " (ON). double feed prevention roller cover cannot be opened if the hopper is not in the "Low" position. For details on adjusting the hopper’s height, see "Changing the Hopper Position" (page 23). 3. Pull open the double feed prevention roller cover towards you by using the indent ( 1 ). 4. Remove the double feed prevention roller ( 1 ) in the direction of the arrow. 5. Take out the new double feed prevention roller in the optional "Roller exchange kit (KV-SS033)". 6. Install the new double feed prevention roller. ( 2 ) to install it. 7. Close the double feed prevention roller cover by pushing it up in the direction indicated by the arrow. prevention roller cover may break. 10. Reset the roller replacing counter in User Utility to 0. Roller" ( 1 ) to reset the counter to 0. You can use the imprinter as a pre-imprinter or post-imprinter, depending on your intended use. The pre-imprinter prints on the face of the document before scanning. The printed material will also be scanned. The post-imprinter prints on the rear of the document after scanning. The printed material will not be scanned. 2. Open the pre-imprinter door ( 1 ). guides until they are locked by the springs. Be sure to correctly match the rib with the slot prior to inserting the connector. 5. Close the pre-imprinter door ( 1 ). For details on installing an ink cartridge, refer to "Installing the Ink Cartridge" (page 72). 2. Open the post-imprinter door. the springs ( 3 ). 5. Close the post-imprinter door. Install the ink cartridge in the imprinter. 2. Remove the protective tape. 3. Move the carriage to the ink cartridge exchange position. When using the pre-imprinter, adjust the position following the label on the scanner. 4. Insert the ink cartridge into the carriage. 5. Lock the ink cartridge adjustment lever ( 1 ). 2. Move the carriage to the ink cartridge exchange position. 3. Pinch the ink cartridge adjustment lever ( 1 ) and lift it. 4. Remove the ink cartridge ( 1 ). 2. Align the indicator ( 3 ) with the green line ( 1 ). • The green line ( 1 ) indicates the printing position. Printing is not available in any other position. 1. Move the carriage to the desired printing position, and align the indicator ( 2 ) with the " " mark ( 1 ) . • The " " mark ( 1 ) indicates the printing position. Printing is not available in any other position. the printing positions are reversed horizontally. Reference Manual and PIE Reference Manual. with User Utility. If the scanner still malfunctions, turn it OFF, unplug the power cord and call for service. The screw is not loosened. Insert the power plug firmly. Disconnect the scanner from the electric outlet and call for service. Connect the USB cable correctly. Uninstall the software from the computer, and then install the software again. The software is not installed correctly. The computer does not recognize the scanner. scanner does not start scanning. Do not connect via USB hub. There is a problem with the USB cable. Use the included USB cable or a certified Hi-speed USB 2.0 cable. The document is not loaded properly. load it again (page 26). rollers, or free rollers are dirty. load it again after reducing the pages. because of curling or folding. ported type of paper or thick paper. (page 20), and scan the copy. The length of the paper is too short. The feeding method is set to manual. The paper thickness mode is not appropriate for the documents. Change the paper thickness mode. it is under the limit mark on the document guides. set slanted on the hopper. The document to be scanned was loa- Load the document correctly. The image sensor covers are dirty. The scanning density is uneven. Adjust the computer monitor settings. special shading paper, which is provided with this scanner. uneven, or when image quality does not improve after cleaning the inside of the scanner. conveyors in the scanning area, and all rollers. If you perform shading adjustment while these parts are dirty, lines will appear on scanned images. 1. Start the User Utility. 2. Click "User Shading" on the main menu, and operate as the image display dictates. For further details, refer to section "4.6 [User Shading]" in the User Utility Reference Manual. not been compensated properly. Clean the parts again, and then proceed with the shading adjustment. or ship the scanner, please follow these instructions. Improper repacking of the scanner may result in a service charge to repair the scanner. Please use the original carton and all of the original packing materials. The scanner should be handled in the correct (horizontal) position. 1. Unplug the power cord from the outlet, and remove the power cord and USB cable from the scanner. 2. Return the exit stopper and extension sub tray to their original (non-extended) positions. 3. Open the pre-imprinter door ( 1 ) and tighten the screw ( 2 ). "Weight in pounds" of paper represents the weight of 500 [432´559 mm (17´22 in.)] sheets. A Division of Panasonic U.K. Ltd.
© 2008 Panasonic Communications Co., Ltd. All Rights Reserved.